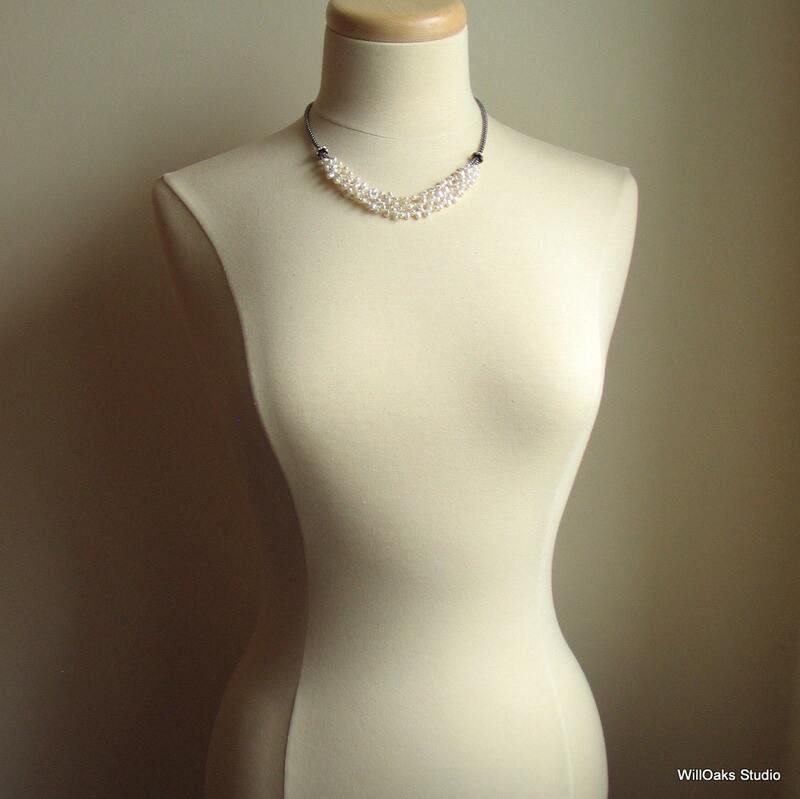 An original white pearl bib necklace design by WillOaks Studio handmade with a multi strand rich cluster of tiny pearl nuggets and a unique sterling silver chain. 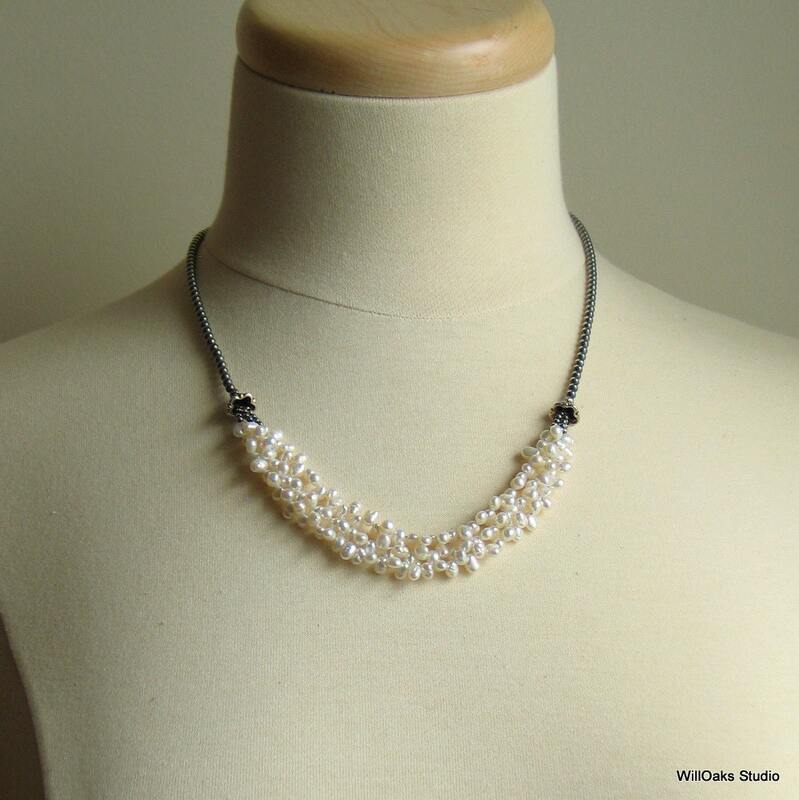 A special freshwater pearl necklace-will you dress it up or down or give it as a special gift? It's your call! 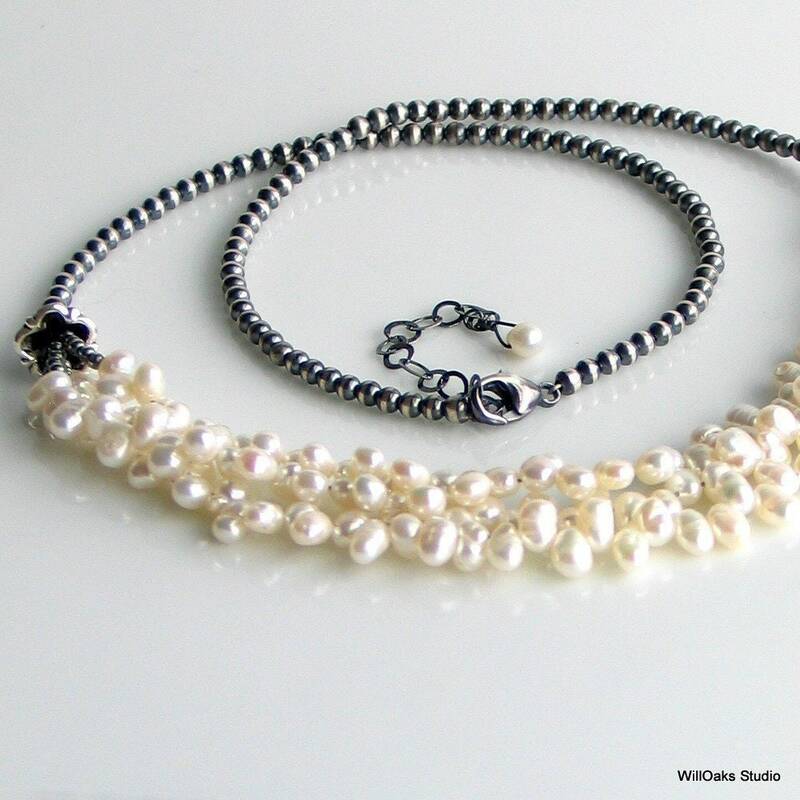 Three strands of tiny top-drilled white pearl nuggets are captured under detailed hefty silver plated "flowers." The WillOaks Studio signature "special chain"-a rich play of sterling silver rendered in contrasting dark and light-completes the original necklace. 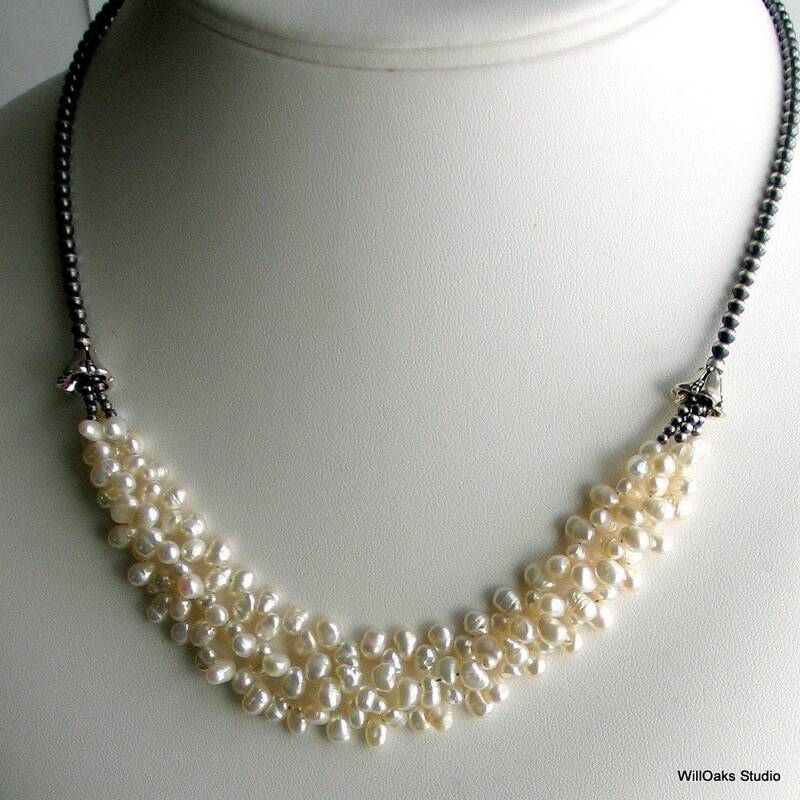 And an original take on the "pearl necklace," only available in my studio. A final white pearl dangles from the end of the extender chain. These lovely pearls are about 5 mm by 4 mm each and are top-drilled. They are wonderfully organic in form such that when clustered together, they are a marvelous lustrous grouping front and center on this special necklace. This design has been a best seller for WillOaks Studio, beloved by women of all ages, for almost 4 years! Gorgeous necklace! I've worn it with a little black dress and heels for more formal occasions as well as with jeans and a nice top for everyday life. The shop owner was lovely and shipped promptly. Thank you so much for a great purchase and great experience! I love the special chain necklaces! 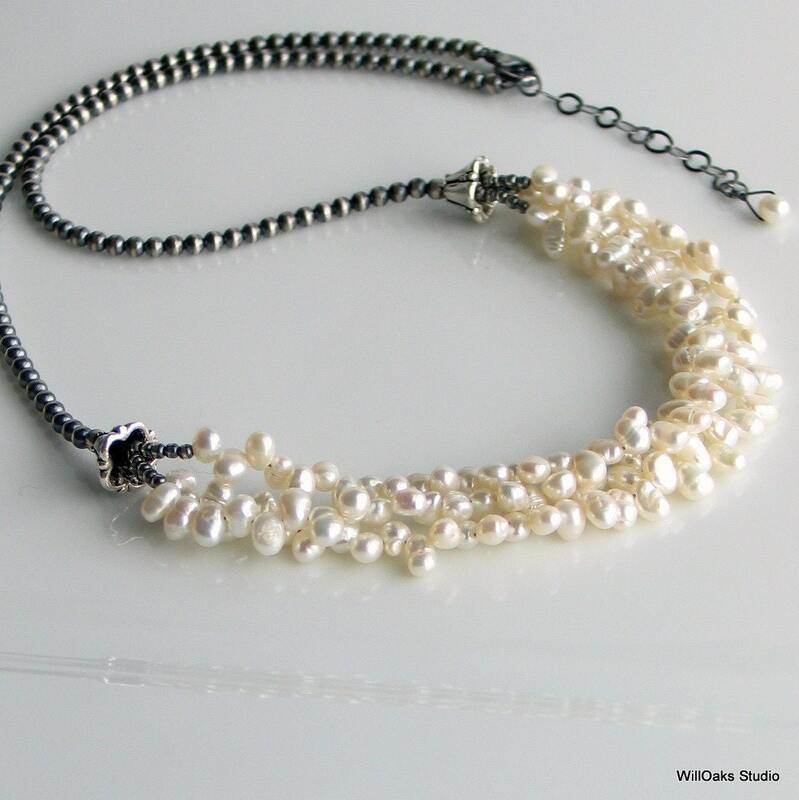 The sterling beads are beautiful and the combination with the pearls makes a gorgeous necklace! So pretty! Pearls have beautiful luster and oxidized chain is nice contrast. Great seller, thanks! Absolutely stunning! Even lovelier than the pic-thank you SOOOOOO much!!!!!! I bought this necklace as a gift for my mother, and I know she's going to love it! Beautiful work!